This story is #3 of the "coupling short story" series from B's Log. Thanks to kasaharatomo on Tumblr for providing the original scans! "Hey, Tomo, isn't it time to finish your break?" We were in the warm, sunny courtyard after school. I was sitting on the grass and on my lap, sleeping with a comfortable look, was my classmate and lover. "Mmm, just a little longer..."
The reply returned from my lap was more sleep-talking than sleepy. Of course, today was perfect weather for a nap, and I felt ashamed to wake up Tomo who looked so comfortable. But I couldn't say that. Soon it would be two hours since he'd started his nap here. That was too long of a break. "Hey, Tomooo. Don't you have stuff to do after this? I have student council work." As I said that, I lightly shook his shoulder. But Tomo only drew his brows together and gave no indication of getting up. Even though his eyes were closed, I could tell he wasn't asleep. It was the same as usual; at times like these, Tomo wouldn't get up. It couldn't be helped; I pinched Tomo's nose and lightly shook it. That's what it finally took, and Tomo opened his eyes. "...Hey, I was still sleeping." He looked up at me with a cajoling look and closed his eyes again. He intended to continue sleeping at any cost. "Now see here... You were sleeping all through class today too. How can you still be sleepy?" "Yeah, I'm sleepy. I'm really sleepy." No matter how usual, I was impressed by how hard he was to rouse. I understood it to an extent, but I thought Tomo's obsession with sleep was at an abnormal level. Ignoring my anger, Tomo gently petted my lap. "But, it's reeeally comfortable being in your lap." "What are you doing? Don't sweet talk me." Even though I was complaining, I wasn't really angry. I was just saying it to wake Tomo and get him up. But if I didn't, maybe I'd be going too easy on him too. As I thought about it, I petted and mussed Tomo's hair. I intended to be a little rough to wake him up, but Tomo was looking so happy. "It's nice. You're the only one who can pamper me like this." With a relaxed smile that he only showed me when we were alone, he teasingly looked up at me and I unconsciously blushed. No good. If I hesitated because of this, I'd never get Tomo up. But, I was really happy that I could look at Tomo's face relaxed like this. Until recently, he'd had it really hard. Now that I knew Tomo, I felt it from the bottom of my heart. 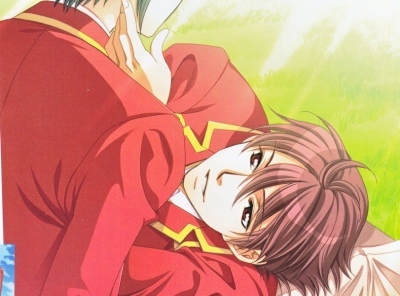 More importantly, I was happy to have become the one who spoiled Tomo, who never relied on anyone before. In the true sense, I actually felt I had become close to Tomo. Tomo reached out his hand as he looked up at me from my lap while I was thinking about it. "Yuki, I think you're smiling." I thought, it wasn't me who was smiling, but Tomo. "I'm not smiling, I'm shocked. Come on, now that your eyes are open, get up." "Then, give me a kiss." "If you give me a kiss, I'll be motivated." "Alright? A good morning kiss." As I was shocked by Tomo's highest class cajoling, I desperately tried to stifle my smile and keep it from escaping. If Tomo found out how much his whim made me happy, I'd be kind of annoyed. As the relaxed and soft mouth suddenly pursed, I slowly brought my face to Tomo's lips.